Usually we get one ‘big’ gift for Christmas, something where grandparents and other family members can contribute too. This year (technically last year as it’s 2016 now) we decided to get a ‘real’ bike for Celine as she has outgrown her wooden balance bike. 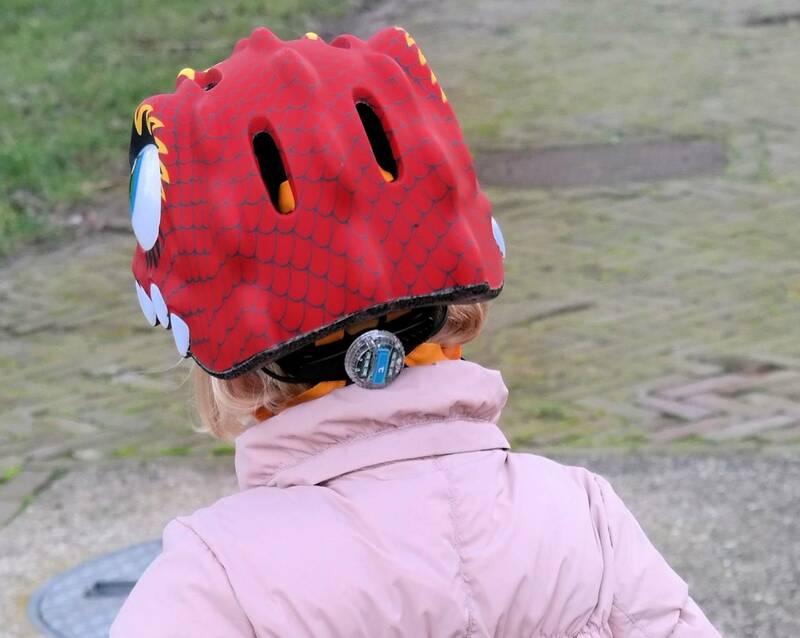 As I grew up in the Netherlands helmets were not very common and it still isn’t a usual sight to see Dutch (kids) with helmets when they ride a bike. Most bicycle roads will be separate from main traffic roads, which lowers the risk to get hit by car. At the moment I study in Germany, where bicycle roads are something I’ve only seen in the big cities. Compared to the rather flat countryside where I grew up, the hills over here (and the fact that children quickly pick up speed when riding there) scare me a bit. In my mind there was no doubt about the need to use a helmet for the kids. In Germany even the adults wear helmets and I wanted to make sure my girls would feel like it’s ”normal” (or ‘the norm‘) the use one too. I came across Crazy Safety helmets on Instagram and loved the comic-like designs. They show that helmets can be fun and attractive for kids. Normally I wouldn’t show any gifts to Celine and Alice before ordering, but this time I showed them the different designs to see which ones they prefer. I would never guessed these two picks. (Celine picked the dragon!!) So I sure did the right thing by showing them the options. At the moment there are 10 different designs, you can get a scary shark or maybe your child will prefer the cute leopard? The helmets are made for big(ger) toddlers. Headsize 49-55cm, so make sure to measure your child’s head to assure a perfect fit. I would say it would fit for the age 3+. The products have a TÜV safety certification. Some of the helmets have ears, which are designed to snap off upon impact. Adjusting the helmet was pretty hard. Okay, I have to admit I’m not that experienced with helmets, but it really took me a while to get the helmets adjusted without it being to snug. You can remove the chin cup if your child doesn’t like it. Alice did chew on the chin cup the first few wears, but stopped it when I asked if I should remove the chin cup for her. Even if the helmets look big or maybe even bulky, they are pretty lightweight with a weight of 255 gramms . They have a shock absorbing padding inside the inner shell and at the back there’s a flashing LED light for visibility. It has a matt rubber surface, and each helmet has cooling vents for added comfort. With a price around 45 euro (in German webshops) it’s not very expensive compared to other helmets. 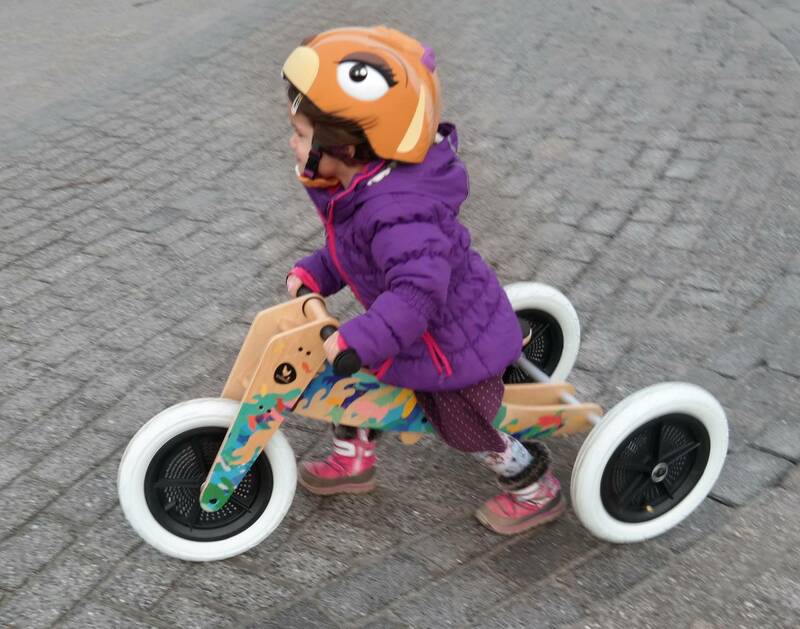 This might be the perfect solution for kids who don’t like to wear a helmet. 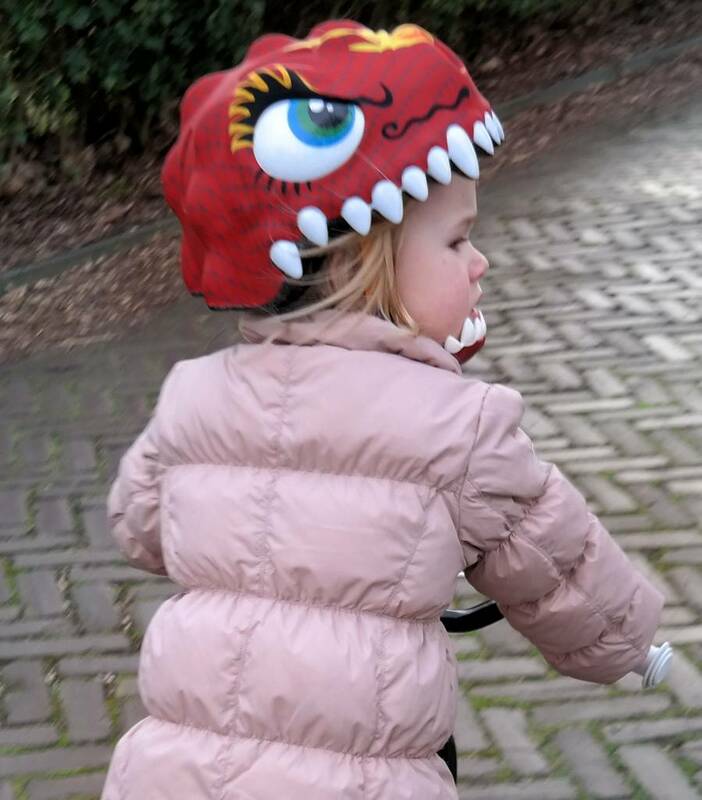 Celine (4,5) sure likes to be a dragon and we get a lot of (positive) comments when we bike around town.